La Maison des Champs is an unusual title for an exhibition of paintings, but in this case it has a relevance because the idea for the exhibition was first kindled when Adrian Hemming was a guest at La Maison des Champs (Jersey) and it is an important part of Adrian's philosophy towards painting that everything has an intellectual beginning and so as the notion of creating an exhibition became a project, to involve in some way the place where the idea was born, seemed appropriate. 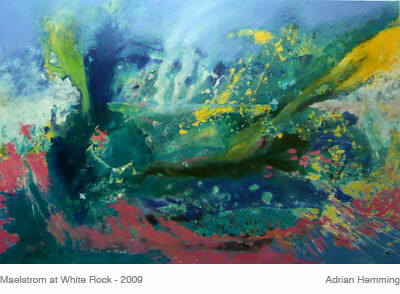 Secondly the title represents Adrian's approach not only to this exhibition, but his lifelong work. When he sees, during his world wide travels, natural subjects that inspire him, he expresses his emotional response by uniting the elements of landscape, place and the atmospheric conditions. In this way he looks into his subjects in his search to find the beginning, because the heart or beginning is important to Adrian, and so La Maison des Champs also represents that philosophy in his quest to understand the process of being. He then goes on to express the summation with both power and subtlety, because nature is a kaleidoscope of brutal power and subtle beauty. That is the inspiration which drives him. Adrian Hemming is a highly respected artist living in London, but the world is his studio. He is widely travelled and has experienced the ravages of time and climate on the landscape of many lands. He has brought his experiences back to London to share with us through the medium of numerous successful exhibitions. Jersey's north coast is a perfect example of where the dramatic forces of nature live in harmony with its scenic beauty. It has inspired Adrian to base this exhibition on some of his walks along the north coast, but you will have to look deep into the paintings for their magic to speak to you. The recognisable structure is laced with Adrian's interpretation of his response to seeing it, to feeling it, to learning to understand it and to finally putting down in paint. His paintings are two dimensional essays on what is available daily for us all to appreciate but we must thank him for showing us a new way to see it.